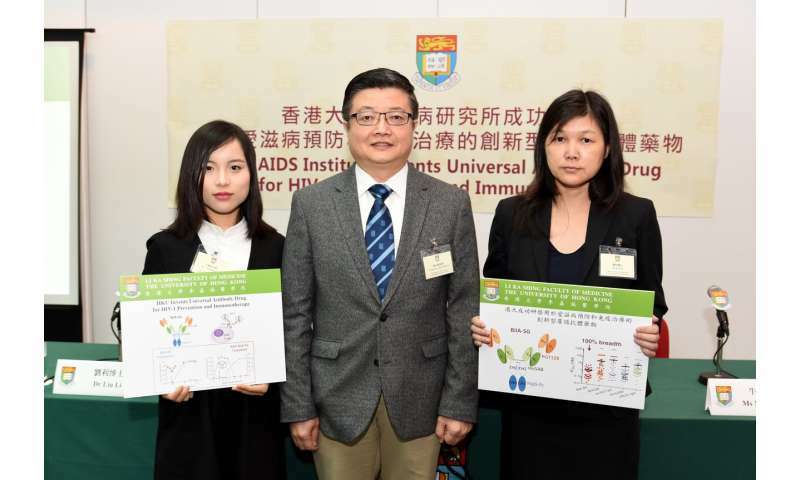 A research team led by scientists at AIDS Institute and Department of Microbiology, Li Ka Shing Faculty of Medicine of The University of Hong Kong (HKU) invents a universal antibody drug against HIV/AIDS. By engineering a tandem bi-specific broadly neutralizing antibody, the team found that this novel antibody drug is universally effective not only against all genetically divergent global HIV-1 strains tested but also promoting the elimination of latently infected cells in a humanized mouse model. The new findings are now published in the April issue of Journal of Clinical Investigation. The HKU research team invented a single gene-encoded tandem broadly neutralizing antibody, titled "BiIA-SG", which "kills two birds with one stone". By attaching to host protein CD4, BiIA-SG strategically ambushes invading HIV-1 particles to protect CD4 positive T cells. BiIA-SG not only displays a potent activity against all three panels of 124 genetically divergent global HIV-1 strains tested, but also prevents diverse live viral challenges completely in humanized mice. Moreover, gene transfer of BiIA-SG achieves pro-longed drug availability in vivo, leading to a promising efficacy of eliminating HIV-1 infected cells in humanized mice. Therefore, the research team provides a proof-of-concept that BiIA-SG is a novel universal antibody drug for prevention and immunotherapy against HIV-1 infection. The accumulated number of HIV-1 infections has more than doubled from 4,443 diagnostic cases in 2009 to 9,091 in 2017, despite the timely introduced combination antiretroviral therapy and prevention interventions in Hong Kong. Currently, the estimated annual cost is over HK$550 millions for antiretroviral drugs alone per year in Hong Kong, not to mention the rising issues of life-long financial burdens, drug toxicity and resistant viruses. The newly invented universal antibody drug brings the hope to fight these issues. With significantly improved breadth and potency, BiIA-SG will hopefully be the first "Made in Hong Kong" anti-HIV-1 antibody drug for clinical development.